Forgive me, my memories of this book are pretty hazy and may not be enough to go on. It was a novel I read as a kid sometime in the 1980s; I'm guessing it was published in the 1970s as I vaguely recall the cover art (an illustration of some type of starship) being in a sort of "1970s" sci-fi art style. It had a sort of Starship Troopers feel to it, but I don't think it was Starship Troopers. I don't recall it being written in the first person, for one thing. I remember there's a chapter where the protagonist(?) is sent on some kind of search and destroy mission as a one-man-army in some sort of heavily-armed exoskeleton, and blasts his way through the enemy until he reaches his final target, where he fires his suit's portable nuclear missile launcher at it and blows it to hell, and then strips his suit off and collapses under a tree. I also recall there are some parts aboard a starship travelling faster than light, and the author describes how the stars wouldn't move during FTL, but would just shift position subtly when dropping in and out of hyperspace. I'm afraid that's all I've got. I've read the synopses for Old Man's War and The Forever War, but they don't seem to jog my memory. The novel that seems closest in formulation is Armor, but at 432 pages I think it's too long; I recall my book being a pretty compact paperback. Edit: I recall that the cover art, at least on the edition that I had, was very much in this style, perhaps even by the same artist. 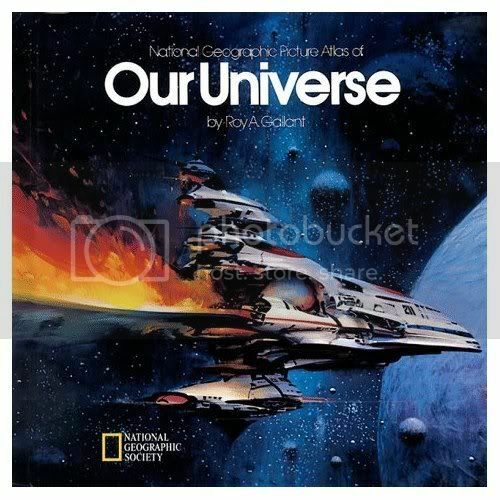 On the whole, it sounds very much like "Behold the Stars" by Kenneth Bulmer. Originally published 1965, my copy is by Priory in England, 1973. It's a slim volume, 120 pages, and the cover art is roughly as you describe, though mine has a giant eye staring out of space, surrounded by planets and stars. It's about future humans battling the alien Gershmi and using "full-augmentation battle armor," which allows rocket-assisted jumps of more than a mile among other feats. I'd have to reread it to see if the battle scene matches. One point of apparent disconnect: rather than having FTL ships, they use sublight dropships to seed planets with instantaneous matter transmitters simply called "boxes." The boxes are part of the central plot point. Armor was in fact written as three "stories" but the version I had, had all of these three in one book. Maybe you came by one of the stories as a separate book? I remember that it had three distinct parts that I think the author even called "Book 1", "Book 2" and "Book 3". Check out the first part/book of Armor, it sounds a lot like what you're describing. Not the answer you're looking for? Browse other questions tagged story-identification novel military-sf or ask your own question. In Starship Troopers (the novel), what are the approximate sizes of the worker and warrior arachnids?